Too often indie filmmakers exhaust their shoestring budgets when shooting a period-piece by not taking advantage of existing historic locations. The Fort Worth Stockyards National Historic District is an invaluable resource for filmmakers hoping to add a little authenticity to their projects without breaking the bank. Miss Molly’s Bed & Breakfast has been a part of the Stockyards since 1910 when it opened as a boarding house called The Palace Rooms. Although the raunchy Wild West days were over, the businessmen visiting Fort Worth’s meat-packing plants found a comfortable place to sleep at Miss Molly’s. The building has changed hands and names multiple times over the years. By the 1940’s it had transformed into a bawdy bordello known as The Gayatte Hotel. In 1989 the downstairs area of the building was remodeled into the Star Café and the upstairs rooms were restored to their original glory. 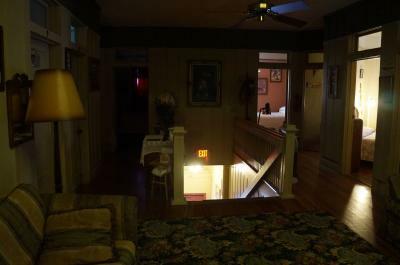 Today, curious visitors can enjoy a night in one of the eight rooms decorated with antiques (but missing televisions and phones). Fair warning: Miss Molly’s has gained a reputation for being one of the most haunted places in Fort Worth! With over a century of operations during some very rowdy times it’s no surprise that there are a few permanent guests. 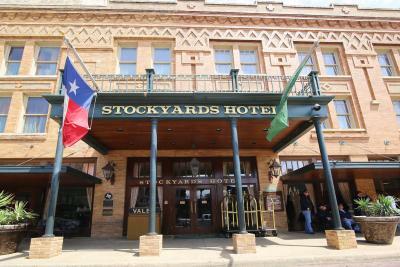 The Stockyards Hotel opened its doors in 1907 to provide lodging for the cattlemen visiting Fort Worth during Cowtown’s heyday as a livestock trade center. Notable hotel guests through the years include country music stars George Strait, Vince Gill, Garth Brooks, and Willie Nelson and movie stars Dan Aykroyd, Nick Nolte, Chuck Norris and Gary Busey. The hotel’s most infamous guests, Clyde Barrow and Bonnie Parker, used Suite 305 as a hideout during their infamous cross-country crime spree that was later dramatized in Bonnie and Clyde (1967). For filmmakers, the lobby of The Stockyards Hotel is like stepping back into the Wild West days that put Fort Worth on the map. From 1982-1984 the hotel was painstakingly restored to match its original appearance. If Miss Molly’s is booked solid during your desired shooting days, a short walk around the corner will reveal another glimpse of the past for your camera. The Stonehouse Bed & Breakfast opened in 1936 as the “Myrtle Robbins Boarding House,” serving the transient cowboys that frequented Cowtown. Eighty years later, the sandstone building still stands only a short walk from the most popular Stockyards bars. 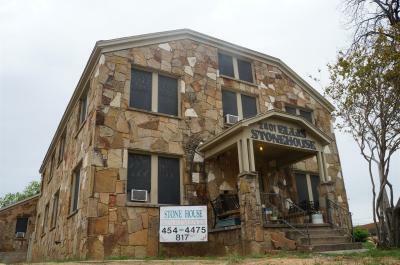 The Stonehouse was restored in 2001 by its new owner, J.B. Hicks, and now provides ten themed rooms for tourists to enjoy. One room still boasts bullet holes in the floor from a rowdy guest years ago. For filmmakers, the Stonehouse Bed & Breakfast is great for an exterior or interior setting and a fantastic place to grab a few hours of sleep before filming resumes. 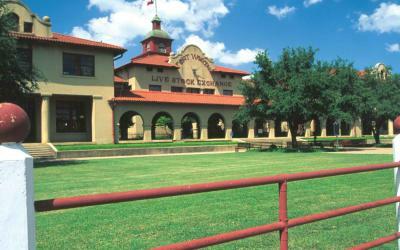 Cowtown Coliseum is at the heart of the Stockyards. Every weekend it hosts the Stockyards Championship Rodeo, which has been the world’s only year-round rodeo for the past 20 years. Construction on the coliseum began in 1907 because of a need for an indoor facility to show cattle. The building was completed a mere 88 days later at a cost of $250,000. In 1917, Cowtown Coliseum became the site of the world’s first indoor rodeo. Cowtown Coliseum is no stranger to filming and has been featured in movies like “Pure Country,” the film which served as George Straight’s acting debut, and “Tough Enough,” where the coliseum was transformed into a boxing arena for a young Dennis Quaid. Scenes from Chuck Norris’s hit show “Walker, Texas Ranger” were also filmed here. The coliseum can be transformed to meet a variety of needs for filmmakers, but is rooted in the history of the West. The Livestock Exchange Building opened in 1902 and served as a central location for cattle traders to conduct business. It also housed livestock commission companies, telegraph and railroad offices, and other support businesses. It was so busy that it soon became known as the “Wall Street of the West.” Today the building is primarily used as office space, although thousands of visitors come to see the Stockyards Museum, which has artifacts from the beginning of the areas development. There are also cattle auctions via satellite every other week that take place from the first floor of the building. The adobe-style building with arch ways and grand steps at the entrance sits behind a large front lawn and makes a picturesque backdrop for photos and videos. The polished appearance and unique style sets it apart from other buildings in the area, and the proximity to parking lots and open spaces makes it an easy location to add to a filmmaker’s list.